Tyler Spencer is due to release his third solo album ‘Here Come The Bags’ in Spring 2015. It includes some acoustic tracks. Five tracks were recorded with William Bates; five with John Nash and one was written by Mark Mallman, with him performing all the music and Spencer adding vocals. A final twelfth track was created on Garage Band. The album release will be supported with a tour and is available on CD and cassette. Couple o’ things. Black Willow is a song written and recorded by Mark Mallman. It was meant to be on his album “Double Silhouette”. He did not feel it was right for that album, so he gave the song to me. It was very nice of him to do this for me. So I just replaced his vocals with my vocals. It’s weird to me hearing my voice instead of his…but the rest of you won’t know the difference. So it’s okay. Also, Stretching Out The Tunes For Mario is a garage band demo of what was meant to be a bigger production….however, at the end, my daughter grabbed my microphone and began singing. That can never be replicated in the studio and I want her to be on my album, so the garage band version is good enough in this case. 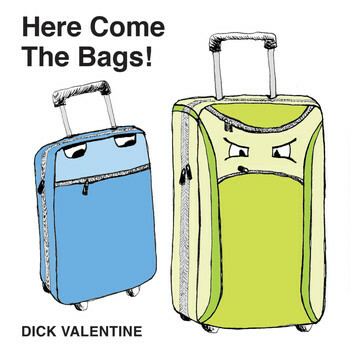 I’m very happy with “Here Come The Bags!” April can’t get here soon enough. I look forward to baggin’ with you.